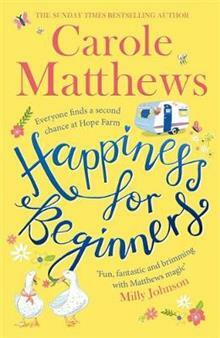 Feel-good and full of emotion, Carole Matthews will make your heart sing with this glorious read. Carole Matthews is the Sunday Times bestselling author of over thirty novels, including the top ten bestsellers The Cake Shop in the Garden, A Cottage by the Sea, Paper Hearts and Summer Kisses, The Chocolate Lovers' Christmas and Calling Mrs Christmas. In 2015, Carole was awarded the RNA Outstanding Achievement Award. Her novels dazzle and delight readers all over the world and she is published in more than thirty countries. For all the latest news from Carole, visit www.carolematthews.com, follow Carole on Twitter (@carolematthews) and Instagram (matthews.carole) or join the thousands of readers who have become Carole's friend on Facebook (carolematthewsbooks).